Please Why Ph drop after reverse osmosis? It will depend on the chemistry of the water that you are treating and you have not given much information. But typically its caused by the carbon dioxide in solution. Two things happen to cause the pH drop. The CO2 already in solution in the feed water will pass straight through the membrane into the permeate or product water with very little going out with the concentrate. Secondly the RO process removes most of the alkalinity which buffers the acidic effect of the CO2 in solution which is in the form of carbonic acid. With less alkalinity to buffer the carbonic acid the pH drops. This typically happens where the feed water is less than about 8.0 ph. Plants that have feedwater pHs above 8 have little or no reduction in pH because no CO2 remains in solution at that pH. "Any water can be made potable if you filter it through enough money"
Agree with Ashtree. 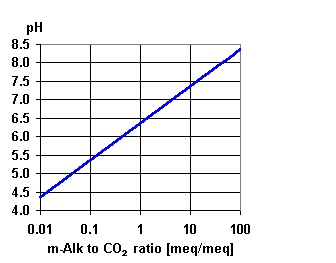 In water, the pH is a ratio of the alkalinity divided by the carbon dioxide. RO rejects the alkalinity but not the carbon dioxide. This causes a lower ratio of alkalinity/carbon dioxide and a lower pH. You are correct that the H+ is the measure of acidity. However, notice also that alkalinity (HCO3) may now be present. People that work in the water business are quite familiar with the ratio of alkalinity to carbon dioxide. Further information from Nalco, a water treatment company. Carbon dioxide is what is known as a weak acid which means that the pH of a carbon dioxide saturated solution will never drop below a pH of approximately 4.3 and therefore will never be capable of etching glass. Strong acids such as hydrogen fluoride are used to etch glass. You are getting close to being a AGW proponent with your comment that carbon dioxide is being absorbed from the atmosphere into water (the ocean). Every atmospheric gas is in equilibrium with that gas dissolved in ocean water. The oceans are a major sink for atmospheric carbon dioxide. However, the oceans are no longer able to absorb the increased concentration of CO2 in the atmosphere without changes to the acidity levels.